2018 Update: SCDNR biologists will be collecting red snapper carcasses from numerous drop-off locations across the coast during the two 'mini seasons' in August 2018. For the first time in several years, recreational anglers in the Southeast have recently had the chance to bring home some prized table fare: the firm, mild meat of the red snapper. Last weekend and this coming weekend, the National Marine Fisheries Service (NMFS) opened red snapper season in South Atlantic federal waters to allow recreational anglers the chance to bring home one fish per person per day. For the marine biologists and fisheries managers at SCDNR, this mini-season represented a rare opportunity to collect more data on a key fish species without setting foot offshore. For 30 years, SCDNR biologists have collected critical data about the fish living offshore from Cape Fear to Cape Canaveral (see our MARMAP program). By identifying, counting, measuring, and sexing the reef fish caught in large traps at specific locations across the South Atlantic, this work has helped experts track how fish such as red snapper, black sea bass, gag grouper, and triggerfish are doing off of our coast. SCDNR staff thus set up freezers across the coast and invited red snapper anglers to share their filleted carcasses, allowing our biologists can make the most of this short season. 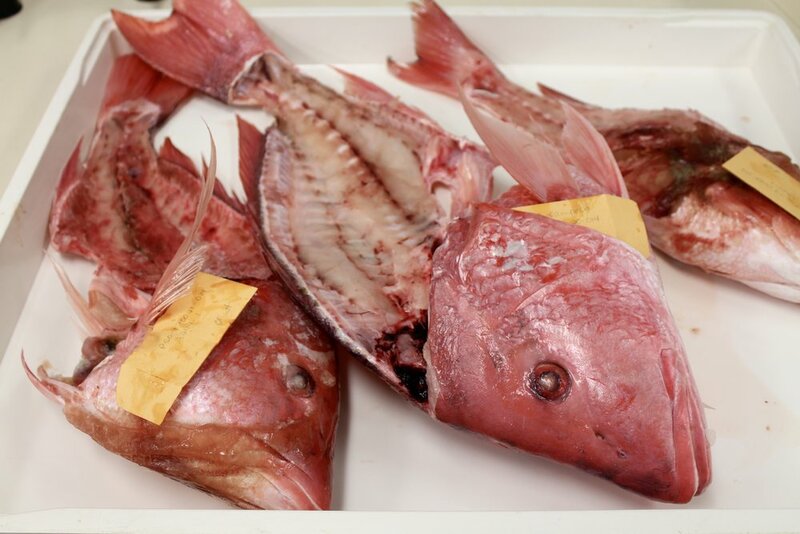 Once the red snapper samples were donated and collected, biologists transported the carcasses to SCDNR's marine lab in Charleston for processing. The process was simple but rarely easy. First, each fish was assigned a number and row on a data sheet. 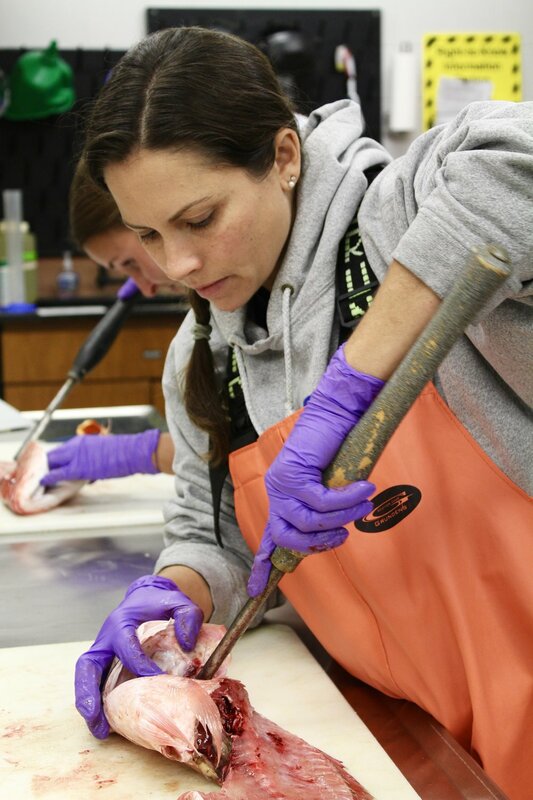 Next, one person determined the length of the fish and looked at the fish’s reproductive organs to tell, if possible, whether the fish was male or female. On a red snapper, female gonads tend to be larger and flesh-colored, while male gonads are similar in shape but smaller and whiter. Next came the messy part. Embedded just behind the brain of every bony fish is an amazing pair of transparent, white structures called otoliths, which help fish to hear and retain balance. Made of the same material as clam or oyster shells, otoliths grow at a regular rate, with visible rings laid down each year of a fish’s life. Just like a tree’s rings, the rings in an otolith can thus be counted to determine the age of a fish. This makes otoliths highly valuable in fisheries science – so our biologists were eager to collect them from already-harvested fish. But getting to the otolith requires expert knowledge of fish anatomy, a lot of practice, and in some cases, brute force and hacksaws. Because these red snapper were already filleted and somewhat frozen, they were even trickier to work with. Once plucked out, the otoliths were stored in small paper envelopes for later cross-sectioning and aging. All of the information gathered this and next week will join 30+ more years’ worth of data, helping ensure that biologists and managers can piece together the most accurate portrait possible of red snapper in our waters. While the offshore forecast looks foreboding this weekend, freezers will still be open and our staff will still be at Fort Johnson from 4-7 pm to receive and process any red snapper harvested off the coast of South Carolina. Even if you can’t drop off your carcass, you can still assist regional scientists. The South Atlantic Fisheries Management Council has introduced a voluntary online reporting platform called MyFishCount, through which you can submit information about your red snapper trip(s). As of Wednesday, November 8, 80 red snapper trips had already been reported through the pilot program, which the team hopes to roll out for additional species next year. Many thanks to the recreational fishermen and charter captains who have generously provided their carcasses already!